Sara Crewe, the heroine of Frances Hodgson Burnett's A Little Princess comes by her compassion, tolerance, friendliness and imagination no doubt through her own charming nature but also as a result of the nurturing of her father for the fist several years of her life. Mary Lennox and her cousin, Colin Craven, the main characters in The Secret Garden, undoubtedly Burnett's best known work, stand in stark opposition to Sara's almost too-perfect person. Both Mary and Colin are vile little creatures who, through death and indifference, have been left to be raised by servants. Growing up in India, Mary is unwanted by her mother and handed into the care of an Ayah as soon as possible. She begins life as a "sickly, fretful, ugly little baby" who grows into a "sickly, fretful toddling thing." By the age of ten when Cholera has taken her parents and sent her to Yorkshire to live with her only relative she has a "little thin face and a little thin body, thin light hair and a sour expression" along with an imperious attitude to make her unattractiveness complete. Colin has suffered equally, abandoned by is father who continues to grieve the death of his mother ten years later but also because, sick from birth, Archibald Craven cannot bear the sight of his son and the thought that he, too, might grow to have a hunchback. In turn, Colin cannot bear to have anyone except a handful of servants see him and he remains hidden away in Misselthwaite Manor. Colin's genuine illnesses have spilled over into hysteria and his frequent fits only serve to feed his physical and mental deterioration. It's amazing, really, that Burnett is able to craft such a memorable, moving story with two entirely unlikable children at its center. Although I doubt that there is anyone reading this who does not know the plot of The Secret Garden, I'll give you the bare bones just in case. Left to her own devices, and with the occasional friendship and guidance of Martha, the sensible young maid who comes from a family of twelve, Mary discovers the secret garden, the one that was locked up and forgotten when Mrs Craven, who's garden it was, died there. With the help of Ben Weatherstaff, one of the gardeners at the Manor, and Dickon, Martha's moor-roaming, nature loving, animal-whispering younger brother, Mary discovers the beauty and joy in nature and a sense of purpose in growing the secret garden back to former glory. Mary also discovers Colin and, being equally unpleasant and imperious, the two become fast friends and find healing and health in the garden. The Secret Garden is such a simple, openly symbolic story in many ways, yet it is the triumph of the children, especially since Mary and Colin who, in the absence of loving attentive adults are withering like the garden itself, that makes it memorable and timeless. 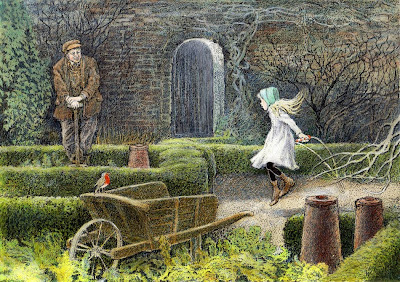 What strikes me about The Secret Garden, especially in comparison to A Little Princess, are the ways in which Mary and Colin remain childlike in their attitudes and outlooks throughout the story, despite adversity. As much as I admire Sara Crewe and her selfless qualities, she has always struck me as a very mature, stoic character in the way that she bears her suffering patiently. Mary and Colin share none of these qualities and, even when they do begin to find their personalities transformed, they remain childish in their outlooks and secretive in their ways. They talk of "magic" as a way of explaining the changes in the garden and themselves so often that you almost want to shake their frail little shoulders. Perhaps that explains the continual appeal of The Secret Garden to children over time in movies (by my count, ten different movie and television adaptations to date) and in book form. One other striking similarity between the two books is the use of animals as important parts of the story. In A Little Princess Melchisedec, the rat living within the walls of the seminary, who Sara befriends and finds solace in. He allows her to stay connected to another living creature in a way that is meaningful. The presence of the curious robin in The Secret Garden serves the same purpose. His willingness to be close to humans, both Mary and Ben Weatherstaff find they are brightened by the companionship of the robin and experience a connection in his presence. Most important of all, it is the robin who signals the existence of the key to the secret garden. In each century since the beginning of the world wonderful things have been discovered. In the last century more amazing things were found out than any century before. In this new century hundreds of things still more astounding will be brought to light. At first, people refuse to believe that a strange new thing can be done, then they being to hope it can't be done, then they see it can be done - then it is done and all the world wonders why it was not done centuries ago. One of the few things people began to find out in the last century was that thoughts - just mere thoughts - are as powerful as electric batteries - as good for one as sunlight is, or as pad for one as poison. To let a sad thought or a bad one get into your mind is as dangerous as letting a scarlet fever germ get into your body. If you let it stay there after it has got in you may never get over it as long as you live. Burnett's book (as well as A Little Princess) demonstrates the power of the mind to shape a life over and over again. As obvious as it may seem, I think this is a lesson (forgive me for using that word...) that bears repeating over and over again for children. Mary and Colin came by their poisonous thinking by way of parental neglect (and Archibald Craven by the loss of a loved one) and their sour characters and despondent outlooks seem understandable. But Burnett also gives us Mrs Sowerby, Martha and Dickon's mother who manages to feed, clothe, love and nurture her twelve children in a tiny cottage with almost no income. On top of this, she finds a way to buy a skipping rope for Mary at the start of the book and send extra food into the secret garden with Dickon when she learns that Mary and Colin are trying to hide their increasing health from the staff at Misselthwaite as they work and play in the garden. Susan Sowerby and her children have every reason to be downtrodden and despondent in their outlook and yet they are the happiest, healthiest people in the book and they share their wealth of positive outlook with those around them. In fact, it is Mrs Sowerby who gently intervenes twice, first on the behalf of Mary, then Colin, to ensure that Mr Craven not be so overcome by his sad thoughts that he looses sight of the children's needs all together. It is important to see the transformations in outlook that Colin, Mary and Archibald undergo over the course of the book, but it is equally important to learn from Susan Sowerby and her family. I also think it is important that, in the character of Archibald Craven, Burnett shows young readers that adults as well as children, can be overcome by negative thoughts and brought low. I'm not sure how much of this young readers will take away from the book, though. Burnett's story, from the cheeky little robin who befriends Mary and leads her to the secret garden in the first place, to Dickon with his moor pony, crow, fox and pockets full of squirrels to the garden itself is rich with enchanting animal characters and natural settings that are described in the most visual way. These aspects are especially enticing if you are reading Inga Moore's gorgeously illustrated edition published by Candlewick for a mere $14.99. While I grew up with the Tasha Tudor illustrated edition of The Secret Garden, I bought Moore's for nostalgic reasons and would strongly recommend you purchase this edition for any young reader in your life. Then, if you have not had your fill of nature and turn-of-the-century British children's literature, snap up Inga Moore's fantastic edition of Wind in the Willows by Kenneth Grahame. 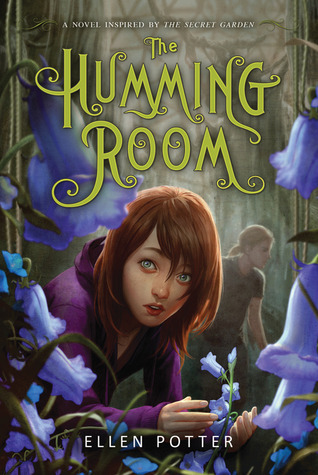 Readers, both young and old, who are fans of The Secret Garden should be sure not to miss Ellen Potter's fantastic contemporary retelling The Humming Room! Have you read Ellen Potter's The Humming Room yet? 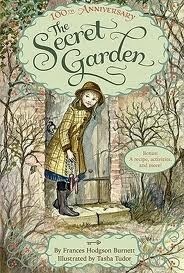 I loved the homage to The Secret Garden and at the same time the beautiful, rich new story she created. Always enjoy reading your beautiful point of view about book treasures. YES!!! I am a HUGE fan of Potter's and was lucky enough to get an advance copy of her newest book, the review of which will post this Friday. I had planned to read The Secret Garden and bumped it up on my list to give me a better perspective when reading Potter's new book, which is fantastic. I think it would be so hard to write a book inspired by a classic and she has created a wonderful contemporary story.